Update: The funny thing about online services is that they can change nearly overnight—and without any notification to the public. Just such a thing seems to have happened to the iTunes Music Store’s search feature. Last week, I wrote the following about my struggles with the store’s search function. Due to the MacBook release, we just went live with it today. Read on for a historical look at some of the things that used to irk me about searching the store. And if you have any other issues with the Music Store’s search feature, feel free to add them to the discussion thread—it seems Apple pays attention to these things, and acts on them quickly. Our daughter is a big fan of the recent Curious George movie —it was the first film she saw in the theater, and she actually insisted we go again (so yes, I’ve seen it twice as well). The other day, we were driving home from somewhere, and she heard (and recognized) the theme song, Upside Down, from the soundtrack by Jack Johnson. So next time we were in the car, of course, she asked to hear it again. Although I couldn’t play it for her then, I figured I’d check the iTunes Music Store when I got home, hoping the soundtrack would be available. Furious George? Hmm, that’s clearly not what I had typed. 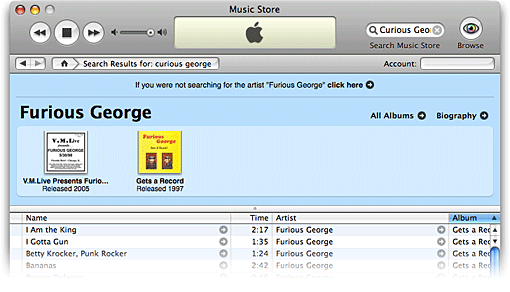 On first glance, it seems that the Curious George soundtrack is not available at the iTunes Music Store—the store couldn’t find any matches, so it returned the next best thing, at least according to its logic. Music Store search experts will, at this point, direct me towards the link that appears above the search results in the above screenshot. Had I clicked that link, I would have found the album. The link’s poor design and placement (it doesn’t really stand out), as well as my curiosity over Furious, led me to completely overlook it. I’m glad I did, though, as it led to my experimenting with the store’s basic search box functionality. , and the album shows up. , though, and I found the Counting Crows’ albums. The first match attempt is a lookup for the exact artist’s name. If one is found (Crows, in my testing), then those are the only results you’ll see—at least, without clicking a link (see below). If there’s no exact artist match, search for artists with the search term anywhere in their name (Junkies). Assuming matches are found in the artist field, the search will also return songs and albums that contain the search term—apparently in any location. My search on Junkies, for instance, returned songs by the Suburban Love Junkies, as well as a song called Junkies Running Day, in addition to the Cowboy Junkies albums. I’m not sure about this last one, but it seems to work like this. If there are no matches for the artist, and there aren’t any albums or songs that start with your search term, then iTunes tries to guess what you really meant to type. In my case, the search for Curious George found no artists, albums, nor songs that started with those words. So the store analyzed my typing and decided I must have meant Furious, not Curious, so I get to see the Furious George matches. This behavior makes it very difficult to predict what the results of a basic search are going to be. Help isn’t much help, either; there’s only a single paragraph to be found regarding searches, and it doesn’t touch on any of these issues. Unfortunately, they’ve placed this link in a spot where you’re almost certain to overlook it— above the album images for anything your search did find (see the first picture above). My eye immediately jumps to the album images and the results listed below. It also has a background that’s nearly identical to the search results box, and the same black text as the rest of the screen. This combination of placement and design has made the button nearly invisible. Ideally, it would appear below the album icons, and above the search results list, and in a size and color scheme that would make it somewhat more obvious. It would also be nice if the Help files for the Store explained how the basic search engine worked. But there’s only a single paragraph to be found on search, and it doesn’t discuss any of these issues. in the Album field on this form worked as expected. Unfortunately, this form is only available from the Music Store’s home page. Ideally, there’d be a button for the Power Search right next to the basic search box. Even more useful would be a link to it from the search results screen. Presently, if you run a search that comes up blank and you’d like to try an advanced search, you have to back out from the results window to the home page, then click the Power Search link and start all over. Despite my complaints, the iTunes Music Store really does a pretty good job of letting users search its sizable music collection. I just wish the basic search functionality weren’t quite so dumb (not finding partial matches) or as smart (trying to guess what I “meant” to type) as it presently is.